Andra Faye was born February 16, 1959 in Indianapolis, IN. Her parents were from the South: her father, the late Harlan Hinkle, was born in West Virginia, and her mother, Ovaline, hails from Tennessee. She has one older brother, Ellis "Ely" Hinkle, who still lives in Indy, down the road from the home where they grew up, and where her mother still resides. Andra Faye currently lives in rural central Virginia with her husband, Chris Jones, and their two cats, Biscuit & Bandit. 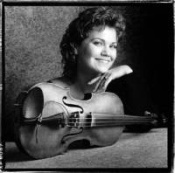 Andra Faye continues to draw from her diverse musical upbringing on her musical journey today. She has been a member of the Nationally and Internationally acclaimed, all female acoustic blues trio, Saffire-The Uppity Blues Women, since 1992. Friends with Ann Rabson and Gaye Adegbalola since they met in 1987 as students at the Augusta Heritage Blues Week in Elkins, WV, she was surprised and delighted when first they asked her to sit in on the recording session of their third Alligator Records release, Broad Casting. So surprised, in fact, she kept suggesting another fiddle player to Gaye-thinking she wasn't good enough! Gaye & Ann insisted they knew how well she played from all their jamming & good times together…and the rest is now Uppity history. She began touring with the group after the recording session, when their bassist decided to leave, although she did not play bass, only much smaller instruments: fiddle, mandolin & guitar. She bought one right away & enlisted a wonderful stand-up bass player from Indianapolis, Chris McMahon, to give her lessons when she wasn't on the road. She took to the instrument easily & had the bass on stage in about six months. Faye also took a leave from her job as a Registered Nurse at this time to pursue her musical opportunity with Saffire. It was a dream come true for her, as she'd never really thought she could make it as a full-time musician, and had worked full & part-time as a nurse, while doing music on the side. She has never yet had to return to nursing, though she keeps her license current, "just in case"! The near-constant touring has taken its toll however, and Saffire has decreased its national & international touring schedule for a variety of reasons. They still perform regularly, but now all of the members have time to pursue other avenues & interests, as well. Faye performs with her husband, Chris & their good friend, Ken Phillips, in a mostly acoustic trio known as "Andra Faye & The Mighty Good Men". Their repertoire is still heavy on acoustic blues, but also includes their favorite country, folk and original tunes. They all share rhythm guitar & bass duties; Andra plays mandolin & fiddle, while Chris plays a mean harmonica & Piedmont finger-style guitar and Ken is a fine lead guitar player. Although Andra does most of the vocalizing, Chris shares the vocal spotlight & is a wonderfully funny guy, as well. Andra also enjoys harmonizing with her husband. Andra is also working with Richmond, VA-based songwriter& pianist Roddy Barnes. They are co-writing and working up material to perform as a duo. Roddy is a wonderful songwriter, and has had two tunes recorded by Saffire: "Because Of You", from "Cleaning House" and "Let The Gin Do The Talking" from "Ain't Gonna Hush. This duo allows Andra to sing full-tilt, and also to add instrumentation to Roddy's great piano work. They are performing standards from blues, jazz & country, as well as original material.